Outsized in the public mind, Route 66 stretches 177 always-diverting miles through the Texas Panhandle. We admired iconic buildings and took on steak-eating challenges for a sampling of the famed highway’s legend. Mother Road. Main Street of America. Will Rogers Highway. These are different names for the same path: the legendary Route 66. Constructed in 1926, this highway stretching from California to Illinois is the most mythologized route since the Silk Road. Its storied path has inspired songs, movies, and TV shows, while its roadsides are bedecked with attractions. 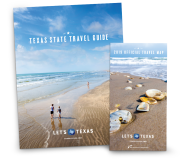 Texas claims its share, and we traveled to some standouts. 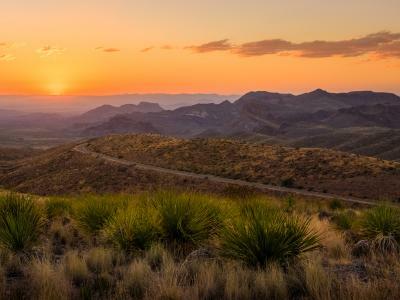 The Texas run of Route 66, cutting across the Panhandle, extends only 177 miles, but it packs a continent’s worth of action—including the historic highway’s middle point. The MidPoint Cafe dining experience transports you to another time. The ’50s-era ambience, hyper-friendly host, and Americana menu completely won us over. I inhaled a chili cheese dog, while my friend made short work of his turkey sandwich. Afterward, we went halfsies on one of MidPoint’s homemade “ugly” pies, which vary in flavors from day to day. Our actually quite photogenic chocolate peanut butter slice was even more delicious than it looked, and the gift shop loaded us with key chains, magnets, and other talismans. Amarillo, the largest Texas city on Route 66, has maintained a bygone era’s charm in 13 blocks touched by the road. The U.S. Route 66–Sixth Street Historic District offer hours of shopping, eating, and sightseeing. We dedicated most of our energies to ogling meticulously preserved buildings, from the Gothic Revival Natatorium to the Art Moderne detailing of Borden’s Heap-O-Cream. Also in Amarillo is Big Texan Steak Ranch, famous for its 72-ounce steak, which is free if you can finish all of it, plus sides, in an hour or less. Our third traveling companion, who deliberately fasted during an earlier meal, took up the challenge. Despite cheers of support and neck massages on request, he failed miserably—unable to finish the leviathan hunk of meat. The sides, which included shrimp cocktail, baked potato, salad, and roll, lay half-finished on the table like ruins left behind after a failed war. But the biggest casualty was our wallet; if you don’t win the challenge, the meal costs $72. Route 66 casts a giant shadow in the popular imagination, but perhaps not as big as some of the literal shadows cast by its roadside structures. Consider the gleaming white cross erected outside of Cross of Our Lord Jesus Christ Ministries in the town of Groom. Standing 19 stories tall, the cross is surrounded at its base by biblical statues. It’s a construct visible from miles away; we were awed by its magnitude. Also in the area, the Leaning Water Tower of Groom spoofs the Leaning Tower of Pisa with a visual gag that merits a quick stop for a photo. The whole “holding up the leaning tower” shot so popular in Italy hasn’t become clichéd yet in Texas, so we got some social-media mileage out of it. Fans of Pixar films will find a small thrill in the town of Shamrock, just east of Groom. Holding court on the roadside is a gorgeous building, with Art Deco detailing, known as the Tower Station and U-Drop Inn Café. Dating back to 1936, the once-bustling service station has been fully restored as a visitor center. But the station’s biggest claim to fame? It’s the inspiration for Ramone’s Body Shop in Pixar’s Cars, a film strewn with nostalgic nods to Route 66. 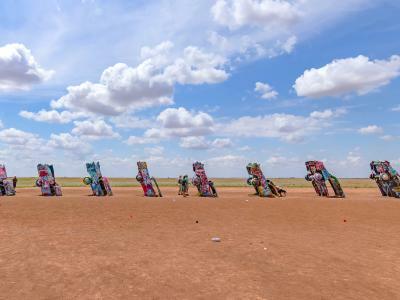 Needless to say, we took plenty of photos—almost as many as we took at another, more famous Texas stop with an Easter egg in Cars: Cadillac Ranch. "Many have tried. Many have failed." That’s the tagline of Big Texan Steak Ranch’s 72-ounce steak challenge. But how many have succeeded? Hard to say, but a list of known winners reaches 39 pages, with 11 champions in the first three months of 2015 alone. Recent comments range from "I did it!" to "It hurts."